Tallgrass prairie. Photo Credit: National Park Service. Click the image to open the Central Lowlands gallery. The Central Lowlands cover an extensive area between the Great Plains to the west and the Mississippi River to the east. 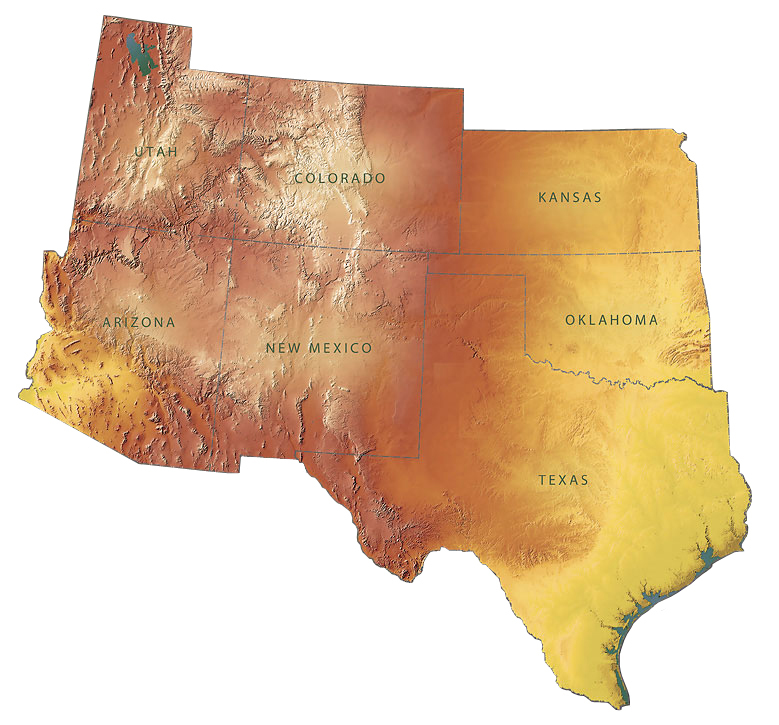 In the greater Southwest region, the Central Lowlands cut through the eastern portions of Kansas and Oklahoma, and northeast Texas – this portion of the Central Lowlands is also known as the Osage Plains. The rolling plains and low hills of the Central Lowlands are some of the most fertile lands in the United States. Area: The Central Lowland province covers more than 1,515,140 sq km (585,000 sq miles). The Osage Plains comprise only a fraction of the total, covering an area of 46880 sq km(18,100 sq miles). Precipitation: Precipitation on the Central Lowlands range from 51 cm (20 in) to 102 cm (40 in). Temperature: Average temperatures on the Central Lowlands range between winter lows in the 20s and summer highs above 90 degrees F, with cooler temperatures in the northern reaches. Elevation: Elevation on the Central Lowlands ranges from 90 m (300 ft) to 600 m (2,000 ft). Vegetation: Vegetation on the Central Lowlands ranges from moderately tall prairie grasses to deciduous forest. Classified as forest-steppe, this vegetative regime includes a variety of grass species, oak, and hickory. To the west, cottonwood, willow, and elm are also common, and to the east, grow maple and basswood. Geology: Fertile glacial loess covers the majority of the Central Lowlands, except for the Osage Plains. Underlying these sediments are soft clays and shales, sandstones, and limestones. Prehistoric Cultures: Paleoindian, Plains Woodland Tradition, and Central Plains Tradition. National Parks: Chickasaw National Recreation Area.